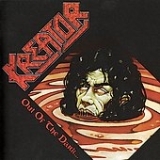 KREATOR - OUT OF THE DARK ... (CD) | Online Shop | Wizard LTD. Album: "OUT OF THE DARK ... (CD)"
Out of the Dark ... Into the Light is Kreator's second EP released in 1988. The live tracks were recorded at Dynamo Club, Eindhoven, Netherlands, in 1988. Tracks 6-8, marked with an asterisk, are European CD bonus tracks.